If you have ever broken or chipped a tooth, you understand the trauma, discomfort, and embarrassment it can cause. When the unexpected occurs, you want to be able to fix the tooth quickly, yet beautifully. Located in Gambrills, MD, Dr. Bingham-Lester offers same day porcelain crowns to restore the function and appearance of your smile. Crowns are caps that are used to restore chipped or broken teeth. Made of porcelain, they restore the function and appearance of your smile. Traditional crowns are created by an off-site laboratory, meaning there is a waiting period before your smile is fully completed. CEREC crowns are fabricated using innovative technology, including digital impressions, CAD technology, and an in-office milling machine. Patients receive a quality crown quickly and efficiently. Comfortable – Digital impressions are taken of your teeth, rather than manual impressions. Aesthetically appealing – CAD technology allows the dentist to design and create the crown on site. 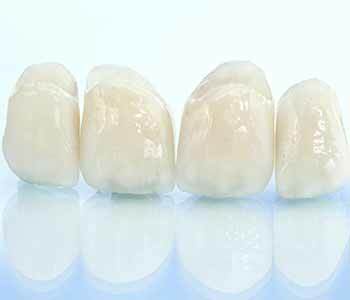 This technology matches the crown to the adjacent teeth in color, size, and shape for a natural-looking result. Functional – CEREC crowns are fabricated using a single block of ceramic. This ensures a sturdy, durable result that is less likely to chip. Feels natural – Once placed, crowns look and feel like natural teeth. They are durable and comfortable and become a part of your mouth. The chewing surface is restored, so patients can eat and speak naturally. Convenient – By having a milling machine in the office, the entire process is completed in a single visit, so you do not have to wear a temporary crown or make multiple visits to the dentist. Safe – Porcelain is safe for patient use and bonds easily to the natural tooth. We all hope to maintain our natural teeth, but life happens. Problems or trauma may occur, causing damage to a tooth. At Bingham-Lester Dentistry, we understand the importance of time, convenience, and quality. With same-day porcelain crowns, we can restore your chipped tooth effectively and efficiently.